'Sum of the Parts' is the official career-spanning documentary telling the story of Genesis. With 2014’s Sum of the Parts, we get a modern look back on Genesis. Like most programs of this sort, Sum uses a mix of archival elements and interviews. In the latter category, we hear from Genesis members Tony Banks, Mike Rutherford, Phil Collins, Peter Gabriel, Anthony Phillips and Steve Hackett as well as author Mark Billingham, New Statesman arts editor Kate Mossman, singer/producer Johnathan King, friend/road manager Richard Macphail, music journalist Chris Roberts, radio DJ Angie Greaves, comedian Al Murray, Rock Chronicles author David Roberts, manager Tony Smith, US tour promoter Ed Goodgold, recording engineer Hugh Padgham, music video director Jim Yukich, Spitting Image creator Roger Law, and tour musicians Chester Thompson and Daryl Steurmer. Sum looks at early musical influences and the formation of Genesis. From there we learn about the band’s early years, changes in membership, the growth of their live show and various albums/musical developments. When the show gets to August 1975, we greet Peter Gabriel’s departure and the decision to carry on with Phil Collins as lead vocalist. The program then looks at changes in the band’s sound, their growing popularity, solo careers, Collins’ departure in 1996 and his return in 2006. Since Genesis started in 1967 and continued until 2007, we find a lot of territory to cover a mere 90 minutes. This leaves Sum as a superficial program, as it tears through various topics at a rapid, relentless pace that doesn’t allow for much detail. Sum may lack depth, but that doesn’t make it a bad show. Indeed, it proves to be quite entertaining as it cranks through the years. The active participation of the various bandmembers benefits the show, especially when we see the “classic lineup” – Collins, Gabriel, Rutherford, Banks and Hackett – together. While I wish we’d gotten more of that footage, I do enjoy the glimpses of the five musicians as they reminisce. Sum also avoids a sanitized feeling. With such strong involvement from the band, the show could’ve turned into nothing more than a peppy, perky take on the group’s history, but that doesn’t occur. Granted, no one will call Sum a gritty, warts and all piece, but it doesn’t shy away from band disputes and issues. Those add to the texture of the piece and give it a more realistic feel. On the negative side, Sum accentuates the band’s 80s run too much. While I know that offered their commercial peak, I still don’t think Sum should focus quite so heavily on that one period, especially since the segment often feels like a rationalization for the band’s move from prog into pop. Sum also completely ignores the brief post-Collins era. In the mid-90s, Rutherford and Banks recruited new singer Ray Wilson and attempted to give the band life after Collins. This didn’t go well – at least in a commercial sense – and the experiment didn’t last long, but it still seems strange that Sum makes no mention of this time. That exception aside, Sum does a decent job of touching on the band’s history. Would I like a longer, better-balanced documentary? Definitely - Sum leaves too many stories untold and probably won’t do much for long-time fans, as they’ll likely find little new information. Nonetheless, it creates a solid “Cliff’s Notes” take on Genesis and entertains well along the way. 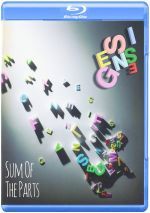 Genesis: Sum of the Parts appears in an aspect ratio of approximately 1.78:1 on this Blu-ray Disc. With its mix of new interviews and archival footage, Sum looked good for this sort of program. As always, I viewed the old material and the new shots with different expectations. The archival stuff jumped all over the place. It could look pretty good at times, but we also got some messy, clips. I didn’t have any real problems with those, however, as I figured they were about as good as we could get. In any case, the flaws of the old bits didn’t interfere with my enjoyment of the program. They blended just fine and didn’t cause distractions. Overall, the new footage offered nice visuals. Sharpness was quite good, as virtually no softness impacted on the new footage. Those elements appeared concise and accurate. Colors were reasonably natural, and no notable defects affected the new footage. Blacks and shadows followed suit, as they seemed perfectly positive. Overall, the visuals were solid given the program’s parameters. As for the DTS-HD MA 5.1 soundtrack of Sum, its reliance on music made it a little livelier than I’d expect from a documentary. Songs were a constant companion, and they spread to the side and rear speakers. Stereo delineation was positive and the overall soundfield seemed acceptable. Audio quality was solid. The new interview comments sounded just fine, as they offered perfectly acceptable clarity. No issues with edginess or intelligibility occurred, as they provided warm and natural tones. Music also demonstrated good range and definition, while the rare effects appeared decent. This mix did enough right to earn a “B-“. In terms of extras, we get nine Bonus Interviews. Collected together, these go for a total of 27 minutes, 46 seconds and offer notes from Phil Collins, Mike Rutherford, Peter Gabriel and Tony Banks. They talk about aspects of recording some albums, influences, solo work, departed band members, live shows and the group’s future. These comments offer a nice complement to the main program. The package finishes with a booklet. It provides liner notes from Craig McLean as well as some photos and it adds a little value. Can a 90-minute documentary offer a detailed view of a band’s 40-year existence? Nope, but Genesis: Sum of the Parts offers an entertaining overview. The Blu-ray comes with good picture and sound as well as some informative bonus interviews. While not as detailed as one might like, Sum still brings us an entertaining summary.